Excuse me, but can I use it for one of my comics ? I'll also add her a Wal-Mart jacket because I'm going to make a parody about Wal Mart (another one). And of course, I'll credit you. When I think of Trixie fighting, I immediately hear this song [link] and then she starts kicking major flank. trixie. oh trixe. oh trixe! WHAT?! 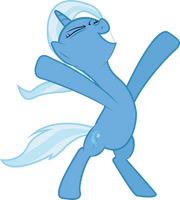 You don't know, whi is Great and Powerful Trixie? !